The London Eye and Houses of Parliament on the River Thames from Hungerford Bridge. 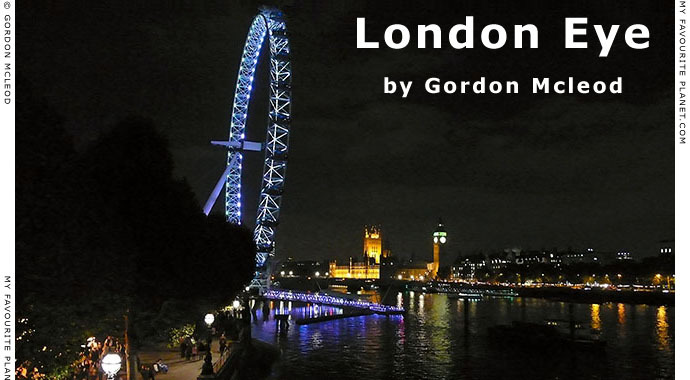 Gordon Mcleod goes up and down and around and around on London's vertical magic roundabout. When they finally let him get off he sent The Cheshire Cat this curious missive. Hungerford Bridge, as most Londoners know, is the means by which southeastern commuters and tourists pour out of large tin caterpillars on wheels into the heart of London's West End at Charing Cross Station. 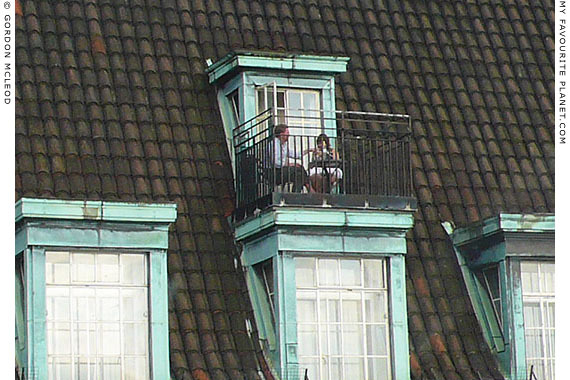 It is also known as the viewing point for the scene above. 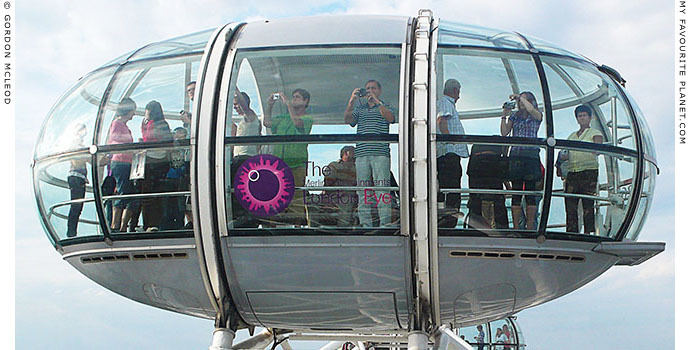 I purchased a ticket with a lot of unsuspecting tourists and was jammed into one of these pods. "Why?" was the big question. We went up and then down, London stayed still, everybody murmured and a few went click. "Oh look," said a victim/passenger, "the buildings are getting smaller!" "When are we getting off?" said a small child. 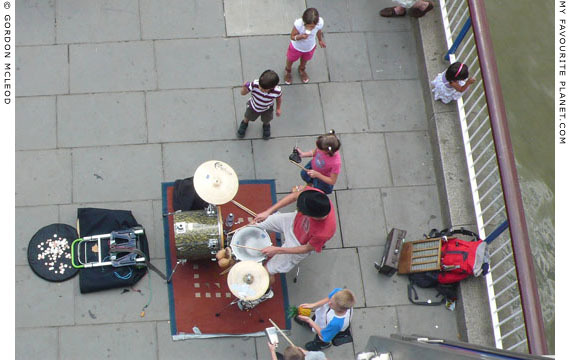 "You can see the whole of Hungerford Bridge from here," said a skateboarder. London Eye, River Thames, London. Enjoying the view from the roof of the old County Hall, Lambeth. Well, there had to be a reason for this sardine-tin-assembly-line-wheel-thing, and it wasn't too long before I discovered it. The wheel served as entertainment for an exclusive couple who could afford to dine out on the roof of the old County Hall, a building that was built back to front apparently, or so I was informed by an architect friend. They could watch the sunset, curse the government, and throw chicken bones at the Eye-pod people. No wonder people want to be wealthy. 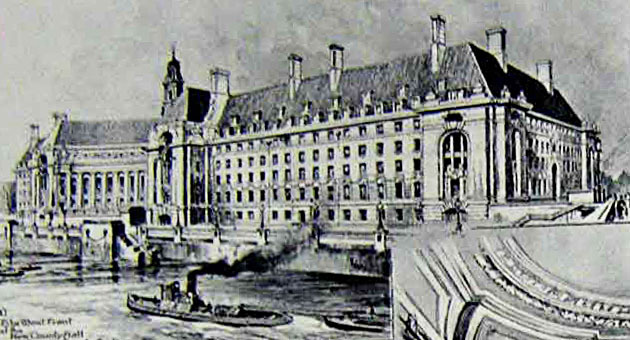 County Hall, Lambeth, London. Designed by Ralph Knott and opened in 1922. Former home of the Greater London Coucil (1965-1986). 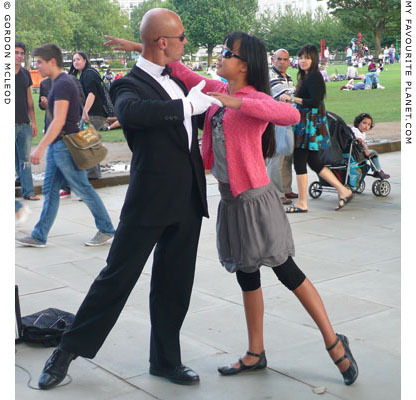 and through Jubilee Gardens, but you do have to run the gauntlet of over-enthusiastic buskers. Queens Walk along the River Thames, Lambeth, London. 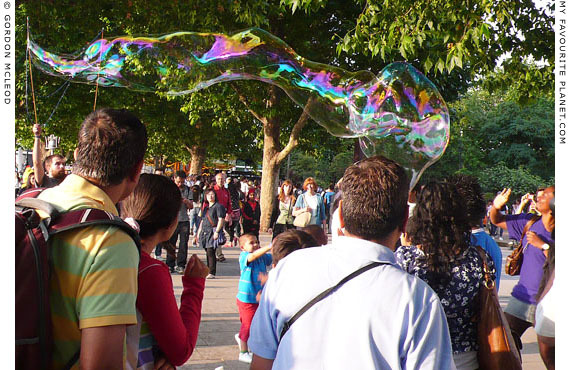 Jubilee Gardens along the River Thames, Lambeth, London. 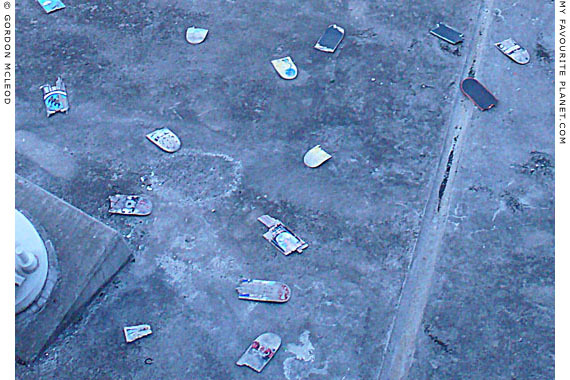 The Hungerford Bridge "Skateboard Graveyard"
Hungerford Bridge, River Thames, London. But I couldn't seem to find any wheels. Have they got their own graveyard or are they served up as a dish in an expensive West End restaurant, as oiled jellied wheels? Who knows? 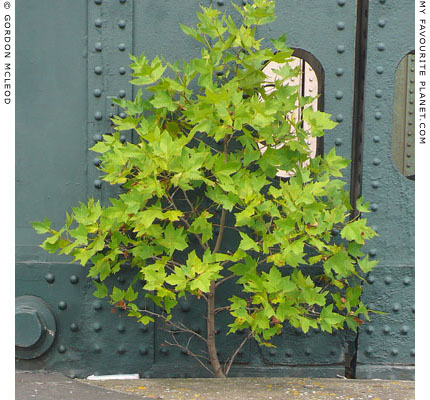 A tree grows on the west side of Hungerford Bridge. 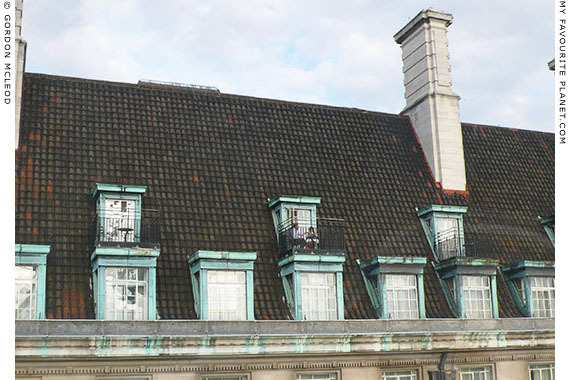 The arched roof of charing Cross Station can be seen in the background. Well, how did it get here? What is its purpose? Was it there before the bridge and they just built round most of it and left the top exposed? Was it the start of a great forest that ran out of grant money? Or was it part of a garden whose owners moved on? 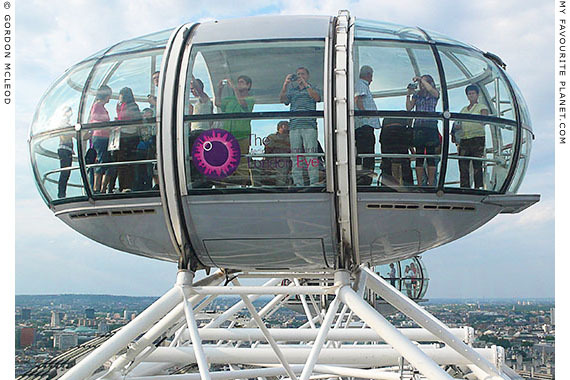 The 135 metre (443 feet) tall London Eye (formerly the British Airways London Eye), also known as Millennium Wheel, is the tallest Ferris Wheel in Europe and the most popular paid tourist attraction in the United Kingdom, with over 3.5 million visitors every year. 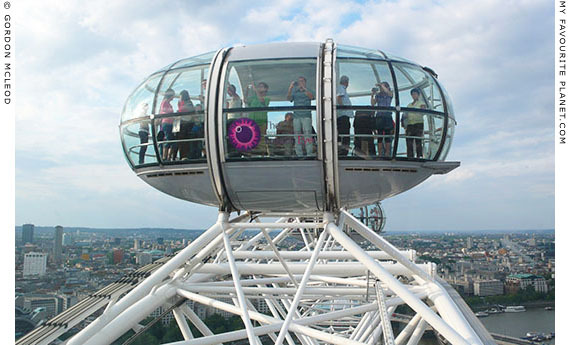 Described by its operators, Merlin Entertainments, as "the world's tallest cantilevered observation wheel", it was designed by Marks Barfield Architects and opened to the public in 2000. The Eye, weighing 1,700 tonnes, was constructed in the Netherlands and shipped to London. Each of its 32 air-conditioned passenger capsules holds around 25 people. When in operation, the wheel rotates continuously at 26 centimetres per second, without having to stop for boarding or alighting passengers (except in the case of the elderly or disabled). A ride takes about 30 minutes. 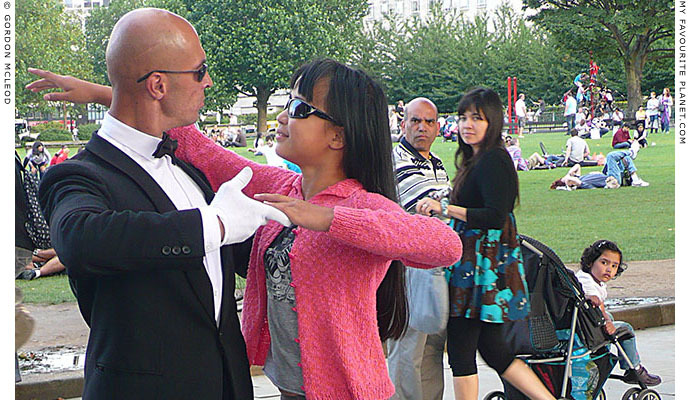 The London Eye is located at the western end of Jubilee Gardens, on the South Bank of the River Thames in the borough of Lambeth, between Westminster Bridge and Hungerford Bridge. Since 2005 it has been a main focal point of London's New Year celebrations, with displays of fireworks set off from the wheel itself. 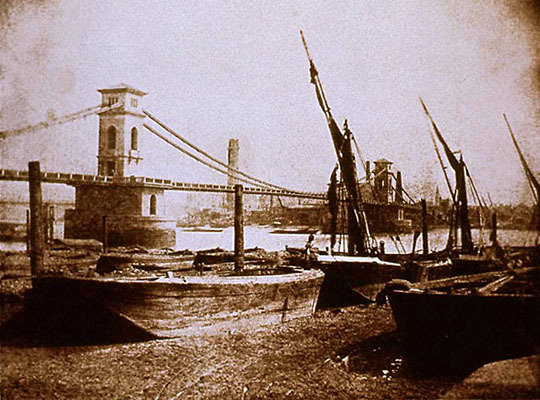 This was the first Hungerford Bridge, a 433 metre (1,462 feet) long pedestrian suspension bridge across the River Thames, designed by Isambard Kingdom Brunel (1806-1859) and opened in 1845. A toll was charged for crossing the bridge. 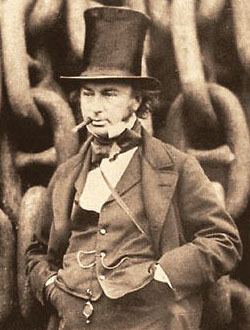 Brunel incorporated a pier for steamers (see picture below), the entrance and steps to which still exist. 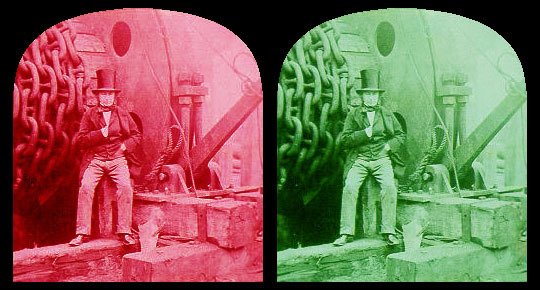 The chains from this bridge were later re-used in the building of the Clifton Suspension Bridge, Bristol, which was completed in 1864, after Brunel's death. 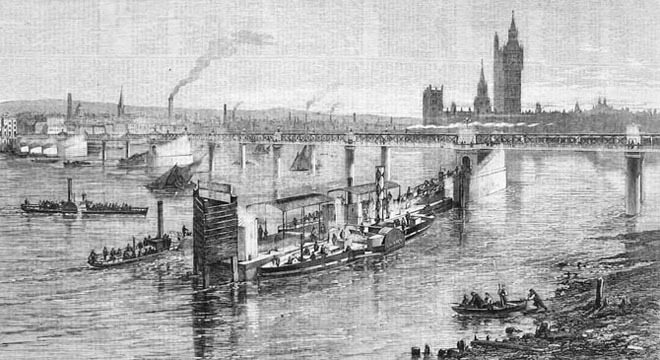 In 1859 it was replaced by a railway bridge (also known as the Charing Cross Bridge), designed by Sir John Hawkshaw (1811-1891), to serve the newly-opened South Eastern Railway company's station at Charing Cross. Originally, there were pedestrian walkways on either side of the bridge, but the upstream (southern) one was later removed when the railway was widened. 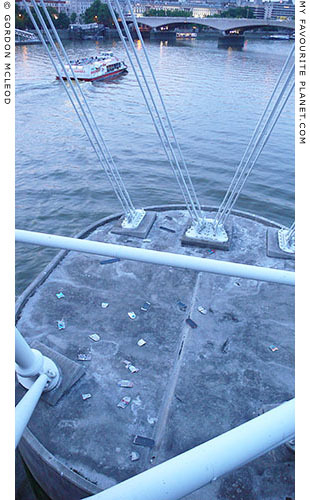 The remaining downstream walkway was also known as the Hungerford Bridge. Pedestrians had a great view of the Thames (wonderful sunsets), but crossing the dingy, decrepit bridge itself was a pretty unpleasant experience, especially with the trains thundering by. This walkway was closed in 1980 and replaced by a temporary one on the upstream side: an even more unpleasant way of crossing the river. 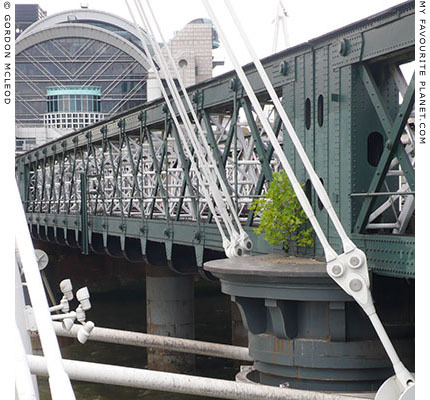 At the beginning of this century the railway bridge received a major facelift and was flanked by two new footbridges, known as the Golden Jubilee Bridges (in honour of the 50th anniversary of Queen Elizabeth II's reign), although many people still call them the Hungerford Footbridges. The original concept was designed by architects Lifschutz Davidson (since 2003 Lifschutz Davidson Sandilands) and engineers WSP Group, with detailed design by consulting engineers Gifford. The project was completed in 2002. To enjoy this image fully, please use the 3-D glasses provided. railway bridge, inspecting the excavation of the Severn Tunnel. 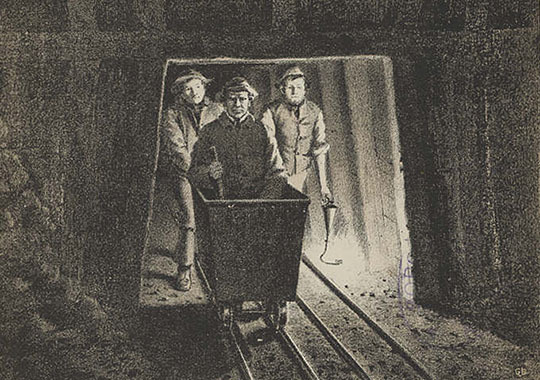 Illustration from The Illustrated London News, 1860. 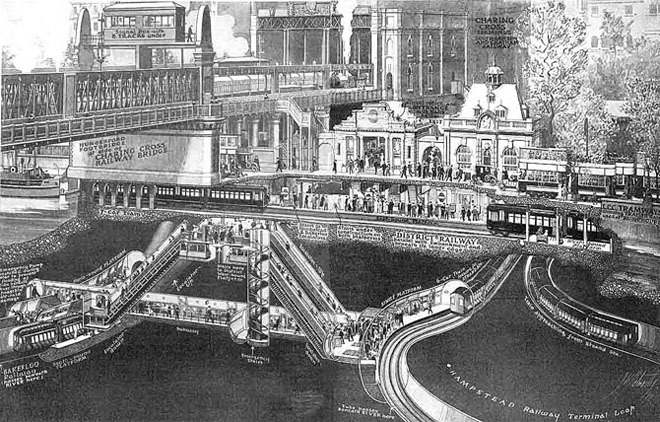 Illustration from Popular Science, 1921. County Hall, Lambeth, London, designed by Ralph Knott in an Edwardian Baroque style. of London County Council (LCC) and from 1965 to 1986 the Greater London Council (GLC). rooms, flats and an amusement arcade. Illustration from The Illustrated London News, 1922.